SYDNEY'S suddenly shaky season has taken another hit with Zak Jones set to miss the next two matches for a high bump against Essendon. Jones was reported twice, including once before the opening bounce for whacking Zak Merrett. He went into the book again after a high bump on Kyle Langdon. The defender has been offered a two-match ban for the rough conduct against Langdon, plus a $1500 fine for the Merrett hit. In the other incident assessed by match review officer Michael Christian, Bomber Devon Smith was offered a $1000 fine for attempting to trip Sydney's Luke Parker. Jones came under fire from commentators for playing the hard man on his terms. "If you're going to talk the talk, you've got to walk the walk," David King said on Fox Footy after highlighting an incident when Jones overran the footy while under pressure from oncoming Bombers players. "It's OK if you don't go, but you can't be on the reverse of that. "I think John Longmire will address that with Zak. It's a problem in his game." 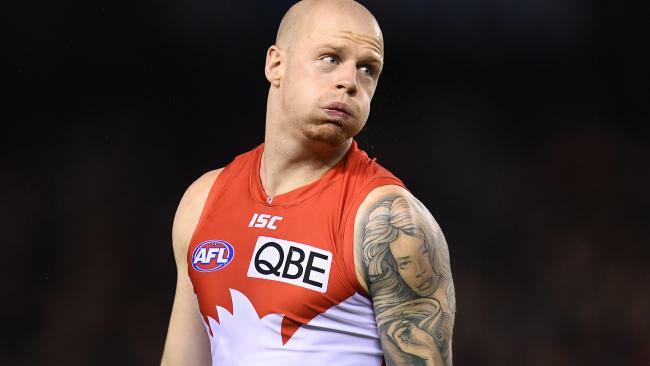 St Kilda champion Nick Riewoldt said Jones would be "disappointed" with his game. 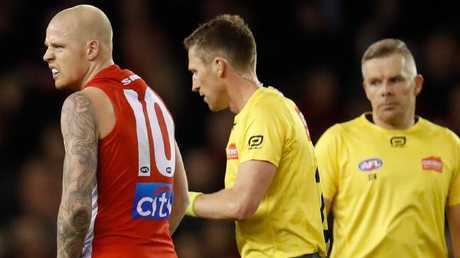 "When he had the opportunity to put his head over the ball, he didn't do it as well as he would've liked," Riewoldt told Fox Footy. "It's one thing to be tough on those situations throwing punches and getting blokes high, but when it's your turn to put your head over it … I'd suggest he'd be getting some feedback from his teammates."